Joe Wiggins, class of 2020 gives campers a tour of the library. 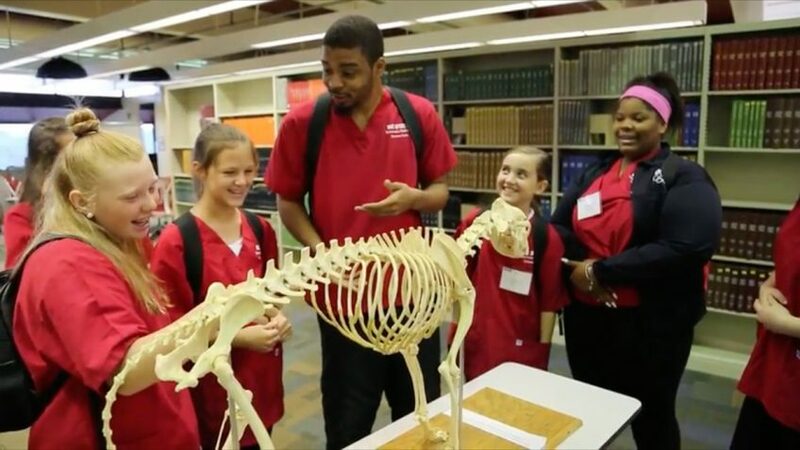 NC State College of Veterinary Medicine Middle School Summer Camp welcomes students from Rocky Mount Preparatory Academy this summer to explore animal health care and get an idea of what a career in veterinary medicine might look like. The camp receives sponsorship through the McKimmon Center for Extension and Continuing Education, part of a collaboration with East Carolina University. After a tour of the library, meeting with part of the Turtle Rescue Team, and a look at the anatomy lab, students don paper gowns, rubber gloves and safety goggles and stand two-by-two over dozen trays of preserved porcine hearts. Led by lab members Dusan Sojourner and Lindsey Cobb, the students take turns with the scalpel, identifying and separating the vena cava with no trace of squeamishness. Enthusiastic campers get a closer look at a profession frequently misunderstood to just mean “pet doctor.” Many students — and indeed, many adults — know only the basics about veterinary medicine and are delighted to discover NC State’s programs include companion animals, equine health, clinical research, pathobiology and a world of career opportunities. Other activities for the week include a visit to the North Carolina Museum of Life and Sciences animal facility and classroom instruction on different zoonotic diseases. Current CVM students serve as counselors, and some, like Terry Stauffer, class of 2022, are former campers themselves. “This camp showed me it was possible to pursue veterinary medicine, and that the potential was there for me,” he says.